“Dream work is a very personal process. There is no Rosetta Stone for interpreting dreams, no universal meaning for every dream symbol,” J.M. DeBord, aka “RadOwl” the reddit.com dream expert. But don’t let that scare you. With a few simple tools, you will soon be on your way to discovering just how much specific, guiding wisdom is packed into your dreams. Jason (J.M.) 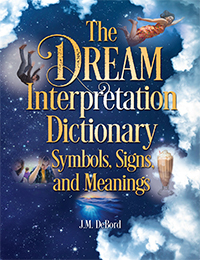 DeBord is the widely acclaimed author of two books about dreams, The Dream Interpretation Dictionary and Dreams 1-2-3. Through his books, media appearances, lectures, and online presence he has taught millions of people to decode the meaning and significance of their dreams. Anyone can understand their dreams, they just need to know how. Start today by signing up for his email newsletter "We Love Dreams." Jason is known as "RadOwl" at the massive social media site Reddit.com where he leads the internet's largest community of dream enthusiasts, Reddit Dreams.